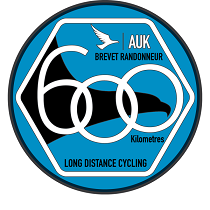 600km cycling event starting from Exeter. Controls at Wells, Cirencester, Brackley, Leighton Buzzard, Pangbourne, Chandlers Ford, Salisbury and Sherborne. Routesheet & gps at ukcyclist.co.uk. Always read the routesheet. The Exeter version of the Buzzard. 'X' rated event with motels available around 300-400km. Postal finish.